To begin your search, type the amount that you are trying to make in the "Make" textbox, the start typing in the name of the item you are making in the second textbox. A dropdown box should come up with a list of possible items. Select the item that you want and hit Go! Golden triangles next to the ingredients mean that the item has to be crafted. Click on the name or the triangle to see what is required to craft that item. You can also click on the golden arrows pointing down to hide the sub-items that make one of the crafted ingredients for your recipe. By clicking this checkbox, the golden triangles next to the ingredients which require sub-ingredients of their own because they are made by a crafter disappear. Selecting this option will only show you items which can be found as drops off of mobs, farmed as a resource, or bought off of a vendor NPC. Selecting this option will hide any critical success optional items that a player would be able to use in the recipe. If you hover your mouse over any icon, the tooltip that you are able to see in game when you do the same appears. This will give you information on its vendor price, any reputation requirements it has, the stats, and so on. You can also hover your mouse over icons not found in game and they will explain their meaining. To add an Item click on the Add Item link on the navigation bar. Once the page loads you will be presented with a few boxes to fill in. If the item is a guild item, then add (Guild) after the item name. 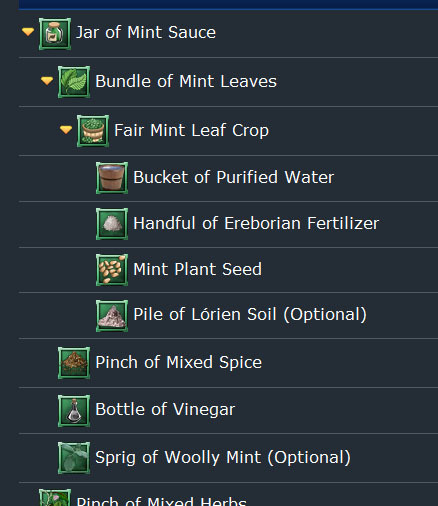 That way when searching through the items it will be easy to determine which one is made by the guild recipe. Eg. Red Dye is an item which can be crafted by a guild recipe. So I would add 2 items. One would be named Red Dye, and the other would be named Red Dye (Guild). Item Price - This value will always be in copper, so if something costs 5 Silver and 53 copper then the amount to enter would be 553 likewise if something costs 5 gold and 43 copper then the amount to enter in would be 5043. If the item is a crafted item, in our case if we are using Apprentice's Ale as the example... I would have to enter the price as 0, as this item is not bought from a vendor. Crafted? 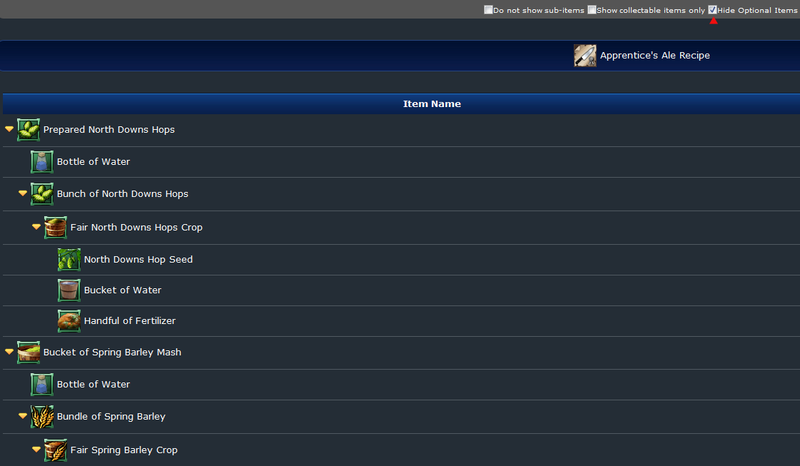 - Select this Checkbox if the item is a crafted item. Remeber: Make the price of the item 0 if it is a crafted item. This is probably one of the more tricky bits of the editing sections. Before you add the recipe to the database you must add all the items required for the recipe to the database. Most of the base ingredients should already be added but as the game evolves new ingredients will constantly need adding. 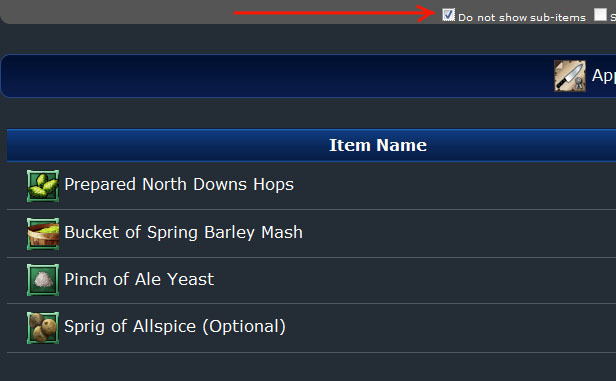 To find out if an item exists in the database start typing its name in the Ingredients text box, this will drop down a list of items which already exist in the database. 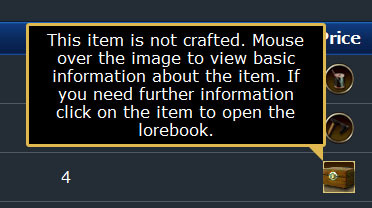 Again as with the item addition I would recommend you have the lorebook page of the recipe open to copy and paste information. Recipe Lorebook Link - Copy and paste the recipe lorebook link into this textbox. 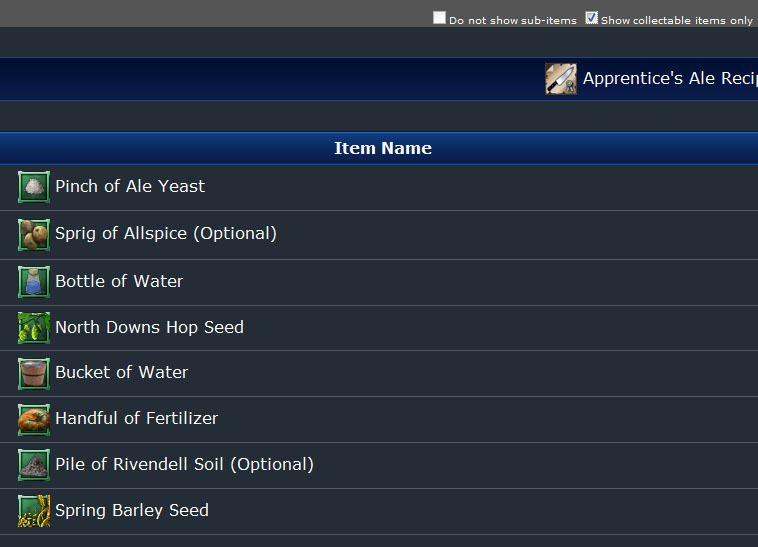 Please note: The recipe link will look similar to http://lorebook.lotro.com/wiki/Item:Apprentice's_Ale_Recipe_(Store). 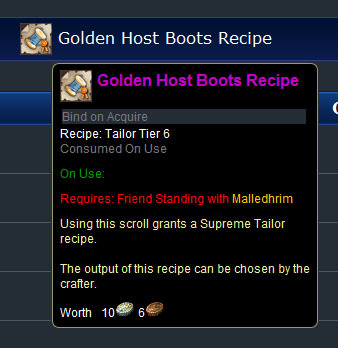 Notice that the portion after /wiki/ is Item: and not Recipe: this is important as the Item: will show stats about the recipe whereas Recipe: will show ingredients of the recipe on the tooltips. So please make sure you get the Item: URL of the recipe. Points Earned for this recipe - This information is not provided on the lorebook, so you may have to ask your friend or if you have a toon that has the recipe then you may have to look it up. As mentioned before you will need to add the items of the recipe before adding the recipe. Fill in all the ingredients of the recipe, if there is more than one ingredient click on the "Add Another Item" button to get more text fields. Clicking on the Select checkbox and click "Delete Selected Item(s)" will remove the items from the recipe. Once all the information is entered in, hit submit. - Fairly straight forward, edit the required fields and hit submit.